Do your employees drag themselves into work? Is office laughter a vague memory? Your employees' morale may need a boost. After all, low morale can lead to poor cooperation, low productivity and increased turnover -- and ultimately hinder a business from reaching its goals. 1. 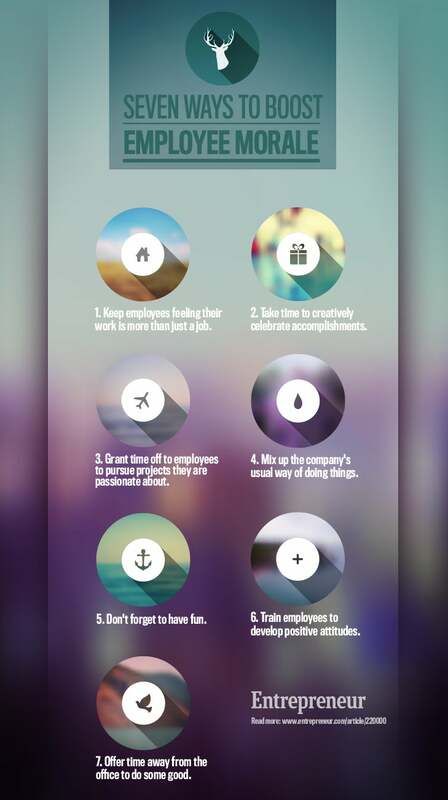 Keep employees feeling their work is more than just a job. Everyone wants to feel that his or her work has a higher purpose. Sometimes, though, that purpose gets lost in the day-to-day grind. One of the key ways that Snagajob.com, an online job-search company, based in Glen Allen, Virginia, inspires its 126 employees is by sharing "I Got a Job!" stories that show them the value of their work. Circulated by email, the real-life stories come from grateful job seekers who recently landed a new job through the company's website. 2. Take time to creatively celebrate accomplishments. It's natural to focus on what's ahead rather than reflect on how much has been achieved. Taking time to reflect, though, helps employees appreciate how much they have done. All departments at Acuity, a financial-services company based in Sheboygan, Wis., are asked each year to recognize their own work by providing a list of significant accomplishments of their team. The lists are reviewed by Acuity officers, who select the 100 most outstanding achievements for inclusion in a "Top 100 Accomplishments" list. The latest list was designed as a book, Acuity World Records, with the help of Guinness World Records, and given to all 831 employees. 3. Grant time off to employees to pursue projects they are passionate about. Personal projects can provide an energizing break from regular responsibilities and can serve as a source of innovation for a company. Atlassian, a developer of collaboration software based in Sydney, encourages creativity during its "FedEx Day." During this event, all 62 employees can work on anything that excites them -- as long as it is somewhat related to Atlassian products or processes, can be completed in the allotted time, and is fun. Employees have from 2 p.m. on a Thursday until 4 p.m. Friday, giving them roughly 24 hours to deliver a project (thus the name, FedEx Day). Then at a presentation, participants show off the results of their projects. From these ideas, Atlassian has adopted more than a dozen projects, ranging from product upgrades to process improvements. 4. Mix up the company's usual way of doing things. Departing from the customary routine of meetings and cubicle life can go a long way toward building morale. The accounting firm Ehrhardt Keefe Steiner & Hottman, based in Denver, uses the concept of neighborhoods to shake things up. All 387 employees are organized into neighborhoods, based on the floors or sections of floors in each office. These groups have regular get-togethers and shape the contours of meetings. For example, during an all-employee meeting day, as the firm staged a neighborhood basketball tournament, each group came up with team names, homemade jerseys, mascots, and cheerleaders. 5. Don't forget to have fun. For the online discounter FatWallet, based in Rockton, Ill., fun is a regular part of the schedule. Its 55 employees are invited to play in a monthly Game Day, an in-house competition with activities ranging from Trivial Pursuit to Wii bowling matches. The company also offers quarterly "fun" rewards when staffers achieve certain goals, such as hockey games, casino nights, or playdays at at amusement parks. Team-building events have included a city scavenger hunt in Chicago and a rooftop Cubs game. 6. Train employees to develop positive attitudes. During the height of the recession in 2009, employee morale became a big issue for 4Imprint, a maker of customized promotional products, based in Oshkosh, Wis. The company's training team decided to try to boost morale by setting up classes for the 419 employees to watch and discuss videos with inspiring themes like Lance Armstrong's comeback from cancer and the friendly culture at Southwest Airlines. 7. Offer time away from the office to do some good. Another way to build employee morale and camaraderie is through community service. Studer Group, a Gulf Breeze, Fla.-based management consulting firm, gives its 114 employees four paid hours a month to volunteer for a charitable initiative or organization of their choice. Departments also take on volunteer projects as a group.